As the Fall fishing season progresses, more anglers are back on the flats with the slight coolness that has filled the air. Often times finding a personal little fishing hole off the beaten path can be rewarding. This time of year is great for finding such spots as the fish are moving into transitional areas and can be found in a variety of different places. Artificials will cover more ground and allow anglers to seek snook, redfish and other inshore species that will be layed up in potholes and depressions along the grassflats. Moving water and some type of structure is the key to producing a good fishing spot that will hold gamefish throughout these next two months. When searching for new fishing holes, it is best to have the boat prepared so that each situation can be thoroughly fished. Having an anchor tied off a stern cleat and ready to deploy once fish are spotted allows unnecessary chaos if a school of fish is found ahead during a drift. The Power Pole is a shallow water hydraulic anchor that works by remote and serves the same purpose as it is deployed silently. By stopping the boat, anglers are able to fan cast an area and cover all possible depths and potholes that will hold fish. Another great tool is a trolling motor that allows a silent approach into shallow areas without pushing the fish out with engine noise. By running the electric motor on low, most trout and redfish will not race off, but merely move a cast away and still give anglers another shot at them. These two accessories are the most important tools on the boat that will be used in finding new fishing grounds. The use of artificials in finding inshore gamefish works well in the Fall as most fish will start to change their diets towards crustaceans and other cold water baits. A great search tool in finding redfish and snook is a single-hook, weedless spoon with a bucktail trailer. Copper with a brown trailer works best where there are mangroves and tea-stained water and silver with a white trailer works well in clear water situations where there is a lot of small sardines. The action of a weedless spoon gives anglers the advantage of working through grass and other debris and still fish all levels of the water column. Soft jerkbaits in turtlgrass or motor-oil color are also working well when rigged with an 1/8 ounce weedless jighead. The erratic motion of these baits will often draw a reaction strike from nearby predators as it swims back to the boat. The darker colors work best this time of year, as it blends in with the bottom and helps to disguise the presentation. 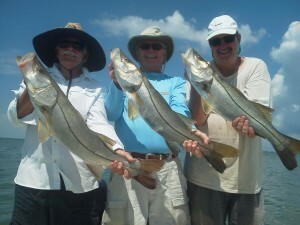 Most snook have moved away from the beaches and are beginning the track towards their winter homes. When this first happens, the bite for these linesiders can slow dramatically compared to the summer bite that anglers are used to. Some extra time must be spent looking for them this time of year. Once located, the best thing to do is take note of where and how they are staged up with the structure that is being used. This becomes a great indicator of where other snook will be found over the next month. 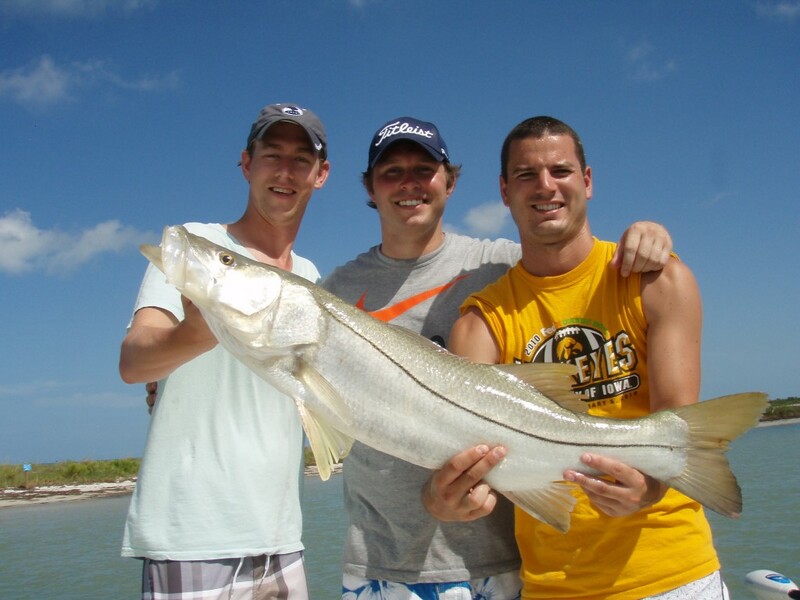 With the gin clear waters off St. Joseph Sound, downsizing leader is a must in order to get most snook to eat. Twenty-five fluorocarbon leader with 2/0 hooks have worked best, as long as the reel’s drag is not too tight to create excess friction and break the line. Freelining greenbacks has worked well and lets the baits swim naturally through a given strike zone without the restriction of a cork. Medium baits have outproduced the larger ones, as it is an easier meal to chase down. 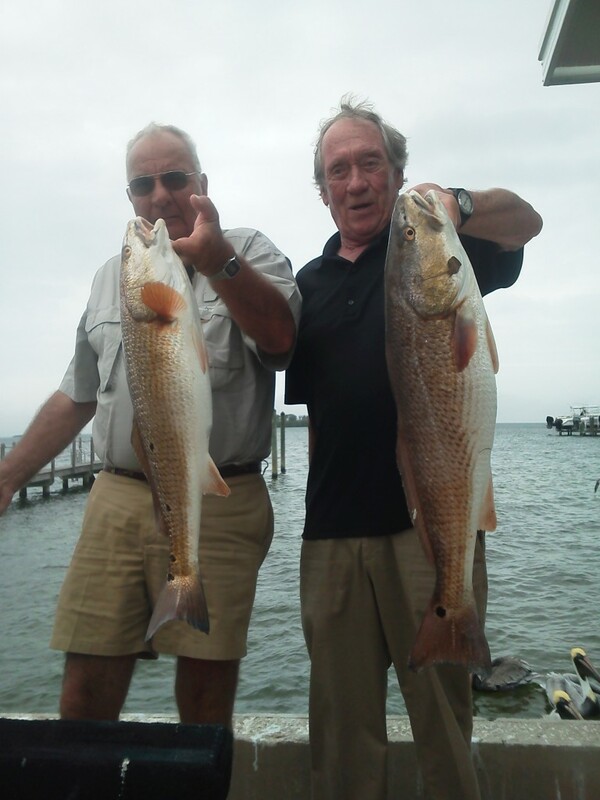 With a steady increase of schools of redfish from Clearwater all the way up to the Hudson area, incoming tides will push these fish upon to a shallow flat and feed aggressively on crabs and small pinfish. A tail-hooked shrimp will allow anglers to cast way ahead of a school without scaring them. This low profile bait works well because it will crawl along the bottom where the reds are searching. These bronze bruisers will get into such as bottom-feeding mode that often times a live bait swimming towards the top of the water column will go untouched. What’s Hot- With the heat of summer upon us, angling during the peak movement of tides will stimulate the fish. The incoming tide will present cooler water and find the largest gamefish aggressively eating as bait flushes through the desired zones. 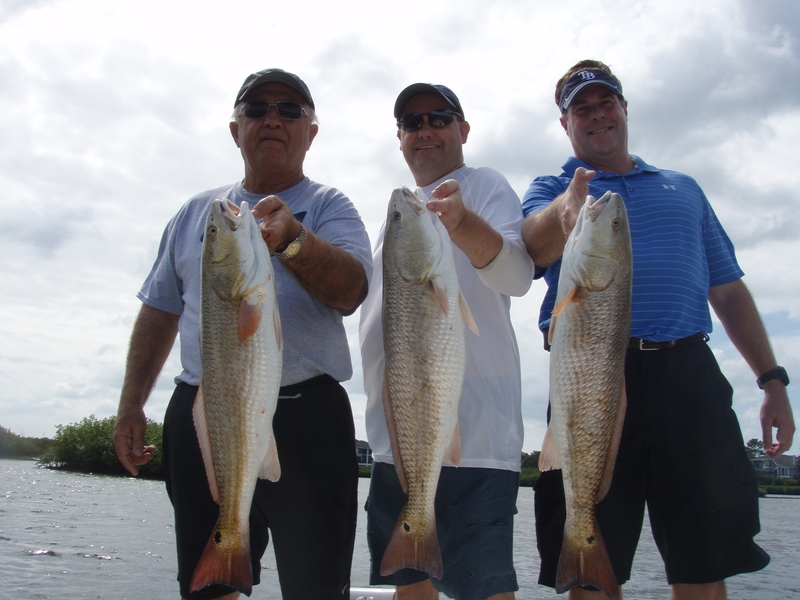 These ambush spots will most likely have deeper troughs and eddies that snook, redfish and trout desire. As the tides flood upon the flats, these predators will roam the skinny water where bait and small crabs will also be moving up into. Sightcasting is at a premium with cleaner water flushing the shallows. Lighter leaders , such as 20 pound fluorocarbon, may be needed in the highly visible waters that flow through St. Joseph Sound. 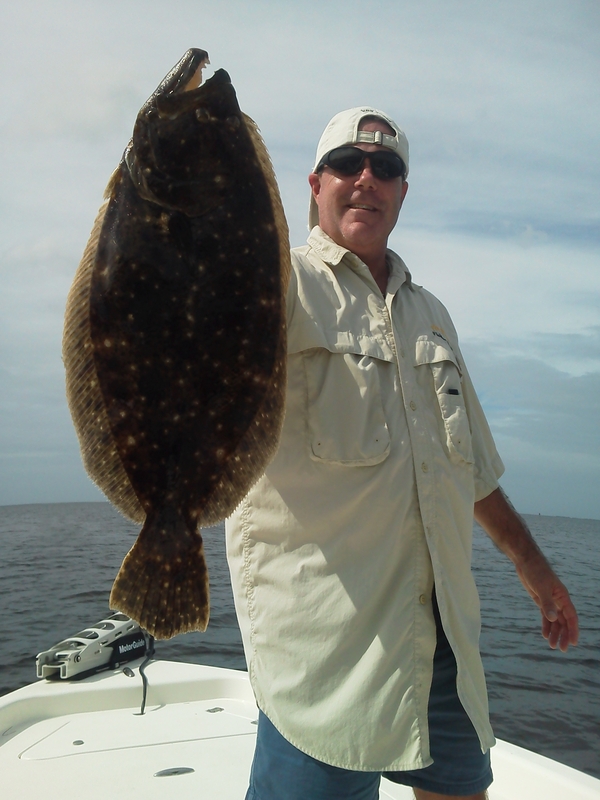 Wadefishing is another great method that will disguise an angler’s presentation around weary fish. The biggest snook of the year are being caught around the stronger lunar tides that happen every summer. As the tide rushes into the passes, these heavy linesiders will patrol the edges and hang around the points and rocky terrains where an easy meal can be found. By placing a 2 ounce lead on the leader, anglers will be able to keep the bait down on the bottom in the swift moving water of the pass. Working the deeper troughs that run parallel to the beach will hold schools of snook in mere inches of water. Pinfish, small finger mullet, sardines and mud minnows are top choices for snook along the shoreline. 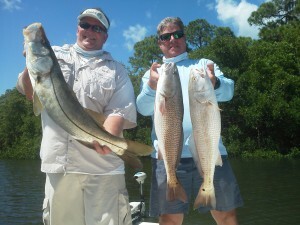 Larger speckled trout, flounder and redfish will use this same highway to hunt down baits. 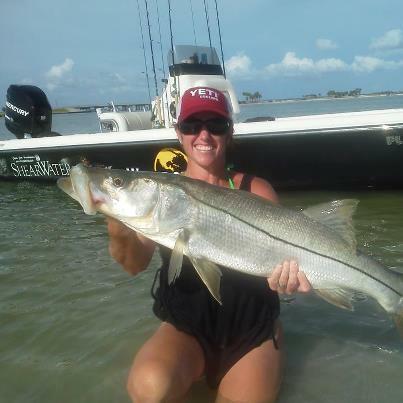 What’s Hot- With springtime upon us, many inshore tournaments will be on the hunt for an inshore slam consisting of a trout, a redfish and a snook. This triple crown of inshore fishing will have anglers working different patterns to catch all three species in the same day. 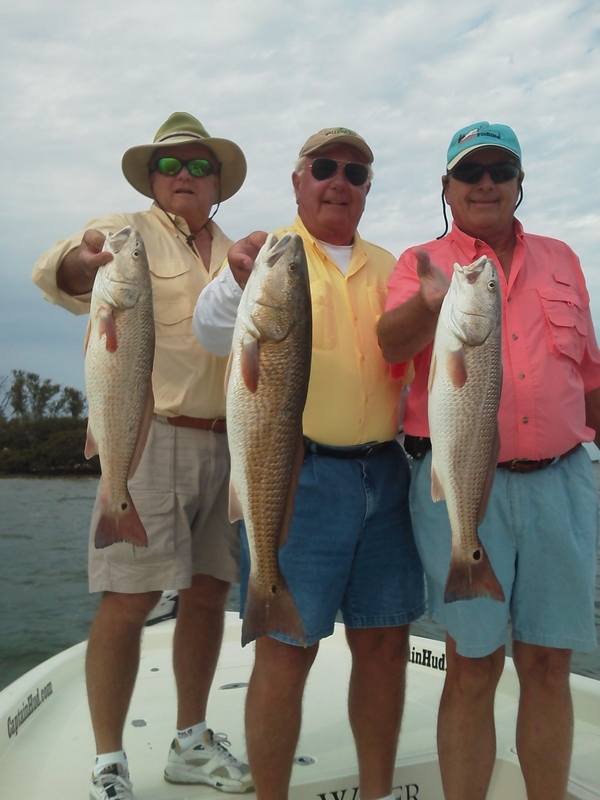 The speckled trout bite has been great while the tide floods around the spoil islands off the intracoastal waterway. Work the deeper edges with sardines or imitation crankbaits. Be sure that the bait placement stays near the bottom, where these predators are feeding. As the tides rise, redfish will work into the shallows and feed among the mullet schools that are easily found among the flats of St. Joseph Sound. 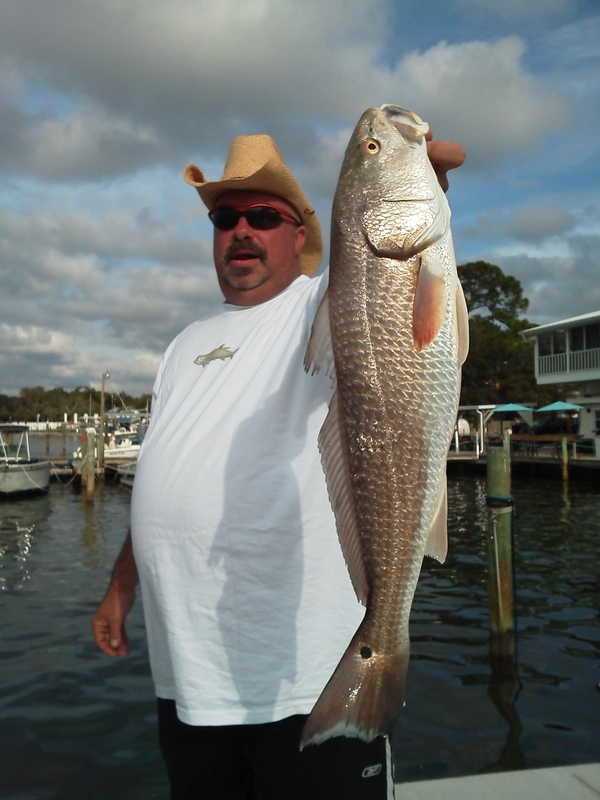 Pinfish, shrimp and cutbait are top offerings for reds which feed primarily off scent. The schools of redfish are averaging 22 to 30 inches and will give away their location by muds mixed in with the mullet. On higher water, work the mangrove roots to dig out the bigger bruisers that use the structure as ambush zones. 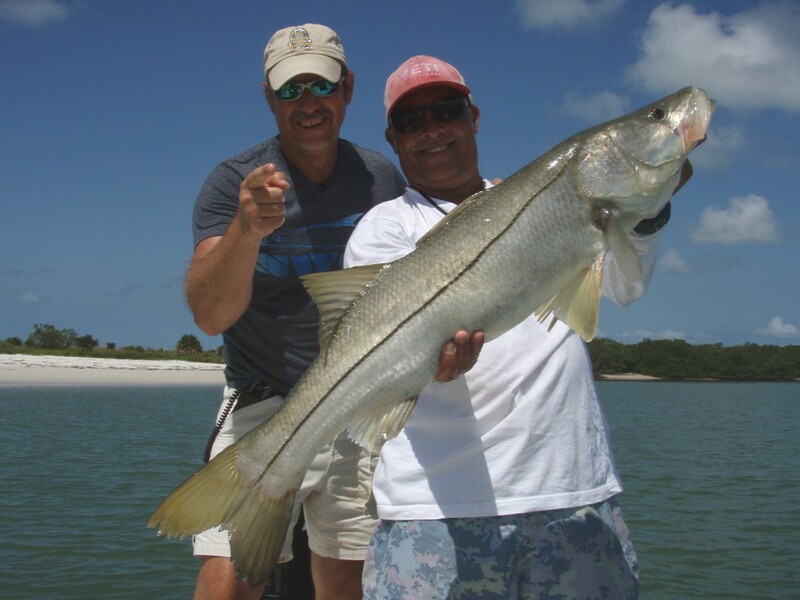 The most difficult fish of the slam will be the snook, as water temperatures keep changing by the week. Most of these linesiders are making the transition from the backcountry toward the beaches. If the water can warm up a little and keep the mercury climbing up towards the upper-seventies, the snook bite should get good in the deeper holes leading out of the bayous and rivers. 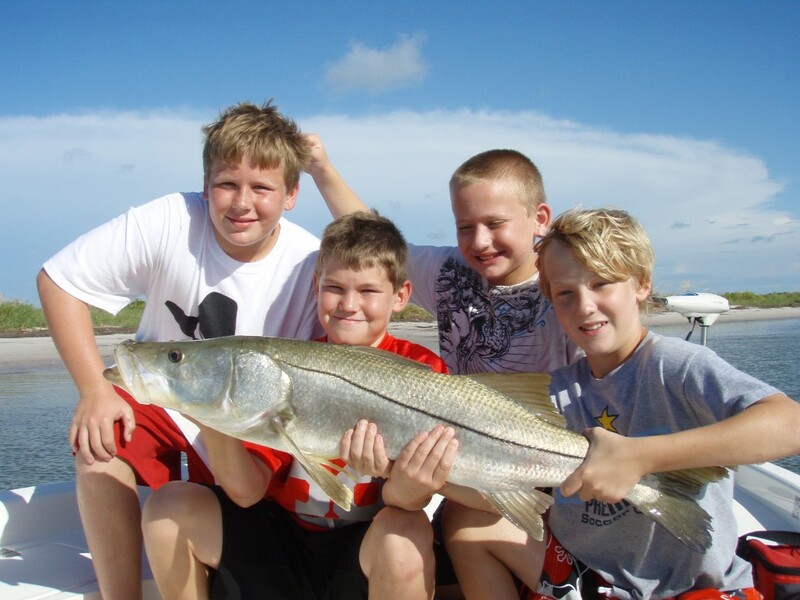 “Whitebait” or sardines are the most valuable tool to catch springtime snook. This candy will make even the most finicky “robalo” eat when presented properly to them. With a warming trend finally in place, the shallows throughout St. Joseph Sound have come to life. As bait schools emerge inside passes and the water clarity is at a premium, both trout and redfish schools are working the flats on flooding tides. Some of the biggest trout of the season will be caught over the next couple of weeks as the full moon will have these females staging up along the spoil islands and oyster bars along the mainshore. Anglers working the swift current along points and dropoffs will have the best luck as these yellowmouths will wait to ambush an easy meal. The redfish schools are holding among the mullet and can easily be sightcasted to as the darker muds will give away their location. Select-sized shrimp have worked best when “bobby-rigged” under a cork. This method keeps the crustacean down in the strike zone longer and draws vicious strikes. On quarter moon tides when the water level is not at a premium, be sure to fish the potholes leading into the flats, as these staging spots are easily seen with a high sun. Working gold spoons is a great artificial this time of year for redfish as it covers a lot of ground and different depths of the water column. With “whitebait” as a weapon, anglers are able to catch snook making the exit from the backcountry. Deeper holes leading into bayous and rivers are the best places to try for the linesiders on falling tides. The outgoing tide will have warmer water and stimulate the bite for the prized gamefish. With changing weather over the last week, wind has played a key factor in determining where anglers will fish. When a good cold front approaches, the wind pattern always brings in a strong south wind and low pressure which stimulates the fish to feed well. The south wind will also bring in extra water on high tides and flood into St. Joseph Sound. 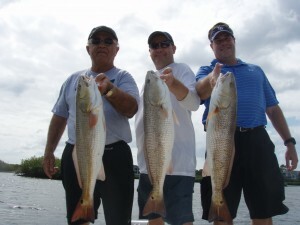 Many oyster bars will have deep water covering them and allow redfish to find bait and crabs among the shells. Working the bars on mangrove points will have increased tidal flow and hold more fish. 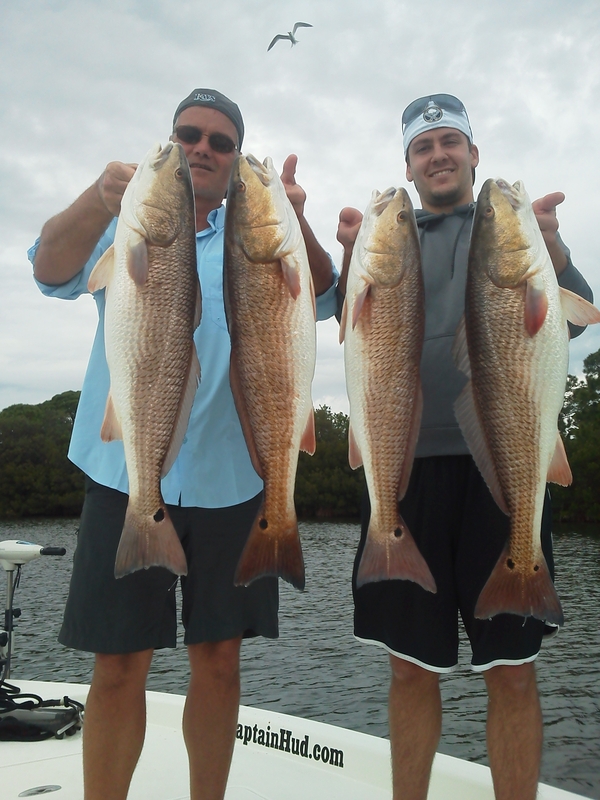 By using the wind to aid in long casts, many of my anglers this week had larger reds crashing free-lined sardines. Twenty pound fluorocarbon leader is needed as the fish will break off against the structure. Big schools of these bronze bruisers should start working the shallows inside the passes around the upcoming full moon on the 26th. 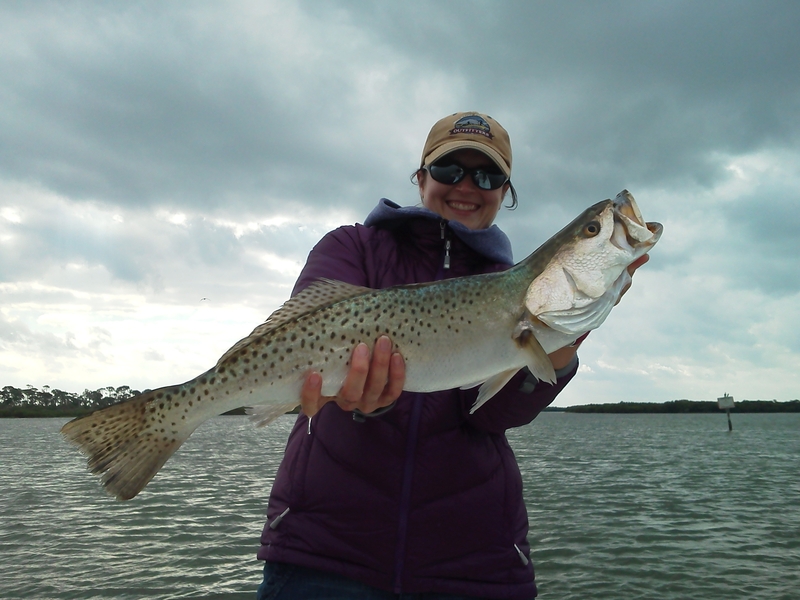 As the speckled trout run gets into full swing in the sound, stronger currents along the dropoffs of islands and flats are holding the big females in search of an easy meal. Increased winds will push bait against the islands and present an ambush spot to feed. Good numbers of fish are being caught at daybreak before the boating pressure slows the bite down. Sightfishing to five pound trout is reaching it’s peak as the fish will lay up in skinny water. Boat positioning is key to presenting bait or lures to these trophy gamefish. As the cooler weather blankets our west coast again, inshore fishing techniques will involve focusing on warmer pockets where gamefish will hold. Shallow flats that are near any type of bayou, river or canal system will have a tendency to stabilize the water temperature. Oyster bars and mangroves are great ambush areas to work. The outgoing tides will invite redfish and trout to use these feeding zones as water flushes through with each tidal exchange. Sightcasting to fish layed up in mere inches of water is exciting in that a Pumpkin Jigs Slamr rigged weedless can be worked slowly along the bottom and still draw aggressive strikes. On the higher tides , the new Mirrolure Paul Browns(The Original) are the key to catching those five pound trout. Once again- the slower the lure is worked the better. Working the sandy potholes with a select-sized shrimp, has lead to a variety of fish this season. Larger pompano, flounder and redfish have all been taken while slow drifting through a grassflat with these depressions mixed in. By locating the big mullet schools, clients are hooking into larger redfish that will feed among the muds left behind. With a high pressure settling in after a front, the clear skies can make the bite tougher. By downsizing in leader to 15 pound fluorocarbon and making those extra long casts, anglers will disguise the presentation better and find more hook-ups. Using a trolling motor or push pole to approach a desired spot is also necessary to help relieve pressure on shallow water fish. The brand new 2012 Fall season of “Average Angler” will premier with a broadcast of Captain Jim in a 2 part series starting Thursday, Sept. 13th at 6 p.m. Watch as Glen Pla and myself catch some HUGE Snook and Redfish along our West Coast of Florida. 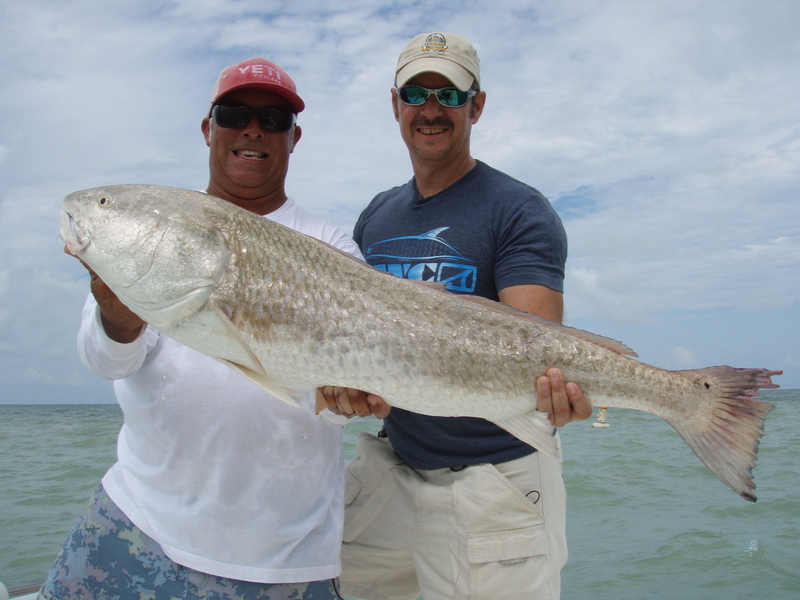 The highlight of the shows will include a 43+” Redfish and a 42+” Snook as we take aim at these large fish in the shallows along St. Joseph Sound on light action tackle. “Average Angler” T.V. – Brighthouse Networks – Channel 47 – @ 6 p.m.
August fishing can still be great as snook and redfish will often hold in the same areas as our larger redfish will move into the passes for the spawn. Our biggest snook of the summer have been caught over the last two moon phases with very strong moving tides that have triggered the bite. Many fish in the 40″ class have put smiling faces on clients. Stay tuned to Brighthouse Networks in September for the new season of “Average Angler” where Glen Pla catches a 40″+ redfish and a 40″+ snook to make a very exciting show. The West Marine seminars for September will be as follows: Sept. 12th – Fall Fishing on Florida’s West Central Coast- Tactics for Nearshore Fishing along the reefs , Sept. 26th – Nearshore Grouper Fishing – Learn to catch that keeper grouper and not burn a lot of gas! August can be a great time to catch some larger snook and redfish. The snook are holding around the passes as the summer spawn is under way. Bigger females are jumping on large pinfish during the fastest moving part of the tide. These gamefish are using the swift current to feed on bait getting flushed by. The concentration of snook along the beaches will hold until early October when they will make the transition toward Fall paterns. The large offshore breeder redfish are moving into position around jetties and nearshore rock structures where our west coast reds will spawn in September. Work the deeper waters with cutbait or big pinfish pegged with a weight to maintain the offering at the bottom. Come join the World of Beer Fishing Team and other Professional Tarpon Tournament Series anglers at the Westchase -World of Beer on Friday – July 27th from 4pm- 7pm for a viewing party. The featured show on Sunshine Network is Week #5 of the PTTS where WOB took home the victory with a 174 pound tarpon. 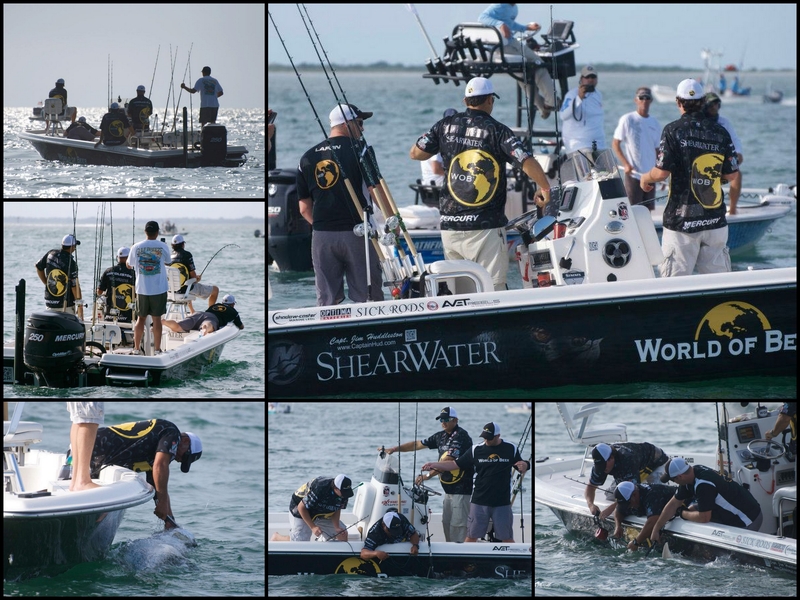 There will be giveaways from team sponsors and a raffle featuring a Tarpon Charter in Boca Grande on the WOB boat.